with organ interpolations by Bach, Reger, Bruckner, Mendelssohn and Rheinberger. Discover your new favourite composers! haunting Missa Brevis by Zoltán Kodály. our new Musical Director, Richard Laing. Rheinberger is not quite a household name in England, but he is well known to organists, for he wrote dozens of sonatas, trios, fugues and solo pieces for the king of instruments. His operas, symphonies and chamber music are all but forgotten, although his choral music is enjoying a renaissance. 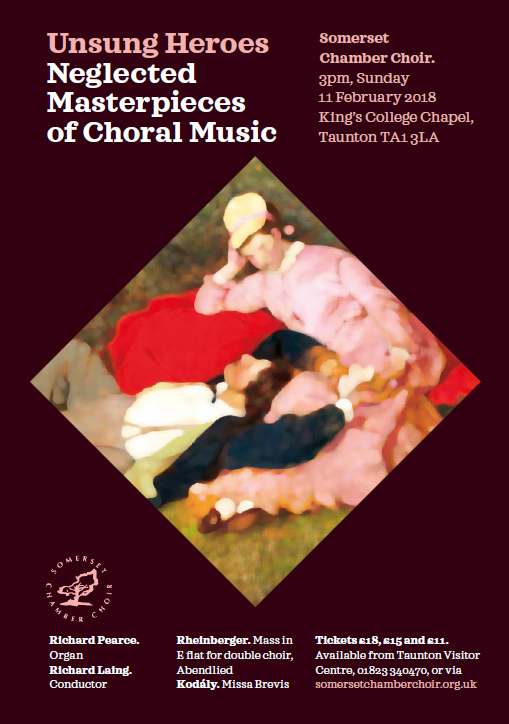 Mass in E flat is an extraordinarily satisfying and moving piece to perform and to hear, whilst Abendlied is one of Rheinberger’s most beautiful and appealing works. First performed in a cloakroom of the Budapest Opera House during the Soviet bombardment, Kodály's Missa Brevis is a beautiful and haunting work spanning the extreme compass of the human voice. For our performance the original harmonium is replaced with organ, as the composer intended, played by our virtuoso organist Richard Pearce.